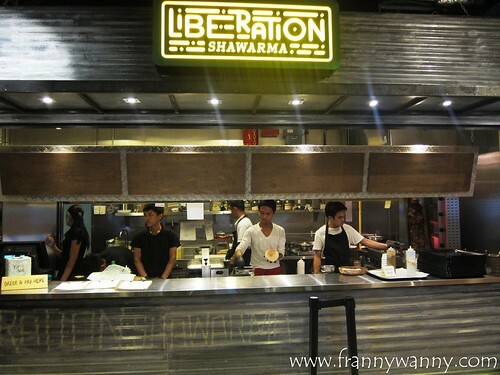 Here's our 3rd stop during our visit at Hole in the Wall -- meet Liberation Shawarma by Chef JP Anglo. This stall takes inspiration from a food truck so you can see how it has a very simple, industrial look. Somehow though, it still blends in perfectly with its neighboring stalls which have a mix of colors here and there. We initially were not planning to try this anymore seeing how all the other things that we have ordered are starting to fill up our table so quickly. However, Pan and I are big fans of wraps and shawarma so this is something we found it so hard to pass up on. They offer three types of shawarma: beef, pork and falafel (chickpea patties). I was inclined towards getting the falafel but I was afraid that it might be too dry and hard to be enjoyed. 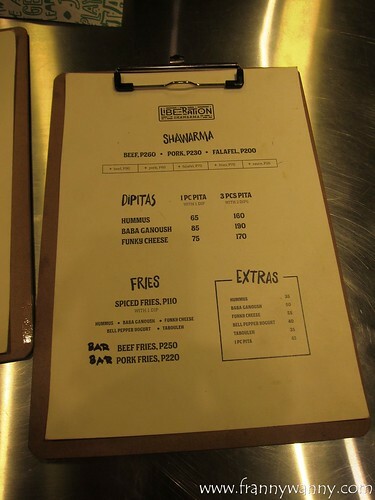 Sadly, beef wasn't available that day so we settled for the Pork Shawarma (Php. 230) with Spiced Fries (Php. 70). What can I say about the food. This is definitely the place to go when you want strong-flavored, authentic Mediterranean food. Perhaps, the spices can be a tad too overpowering for others and there might be a need to tone it down a bit to cater to the local market. It's interesting also to note that instead of using the usual shawarma wrapper, they made use of pita pockets instead which lessens the mess. Yay! My mom for instance, just had a small bite and quickly pushed back her slice of shawarma. She isn't a fan of Mediterranean food so it was no surprise that this didn't wowed her at all. To be fair, the meat was very tender and I love how evenly flavored the whole shawarma was. The pita was soft and yummy too. As for the Spiced Fries, this is probably one thing that I wasn't too crazy about. The fries was so spicy that I could hardly taste anything else as it has instantly numb my tongue. I'm definitely skipping this next time. I do believe in second chances and I can't wait to give Liberation Shawarma another try. Hopefully, beef will be available by then. 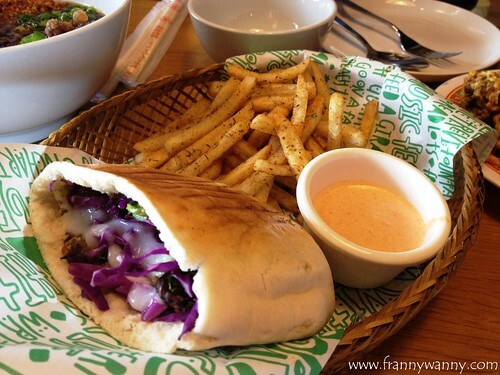 Now I'm really craving for shawarma...thanks for the tip, Fran!